I finally finished making my DIY cage! I needed to free up some floor space so I built a cage to sit on top of my dresser. It's modeled after the Martin's design (I probably should've just had them quote it out for me because it wasn't cheap to make). It's more or less the size of two R-680s stitched together side-by-side. Like a lot of folks' rats, my boys were really only using the top level of their DCN so I don't feel bad reducing their overall cubic footage because I've increased their "top floor" space. This cage is 63" wide x 18" deep x 24" tall. Overall, it's about 15.5 cubic feet with 13.5 square feet of floor space. With the long layout and multiple levels, I don't feel I have to hang as many hammocks to fill the space. This was one of my biggest issues with the CN. Also, because there are vertical bars every half inch, it's a lot easier to hang hammocks in this cage than it was in the CN. I also switched from split-rings and lanyard clips to 1" s-hooks. They're cheap and easy to hook on to the bars and there's less concern for scratching the powder coating than with the lanyard clips. 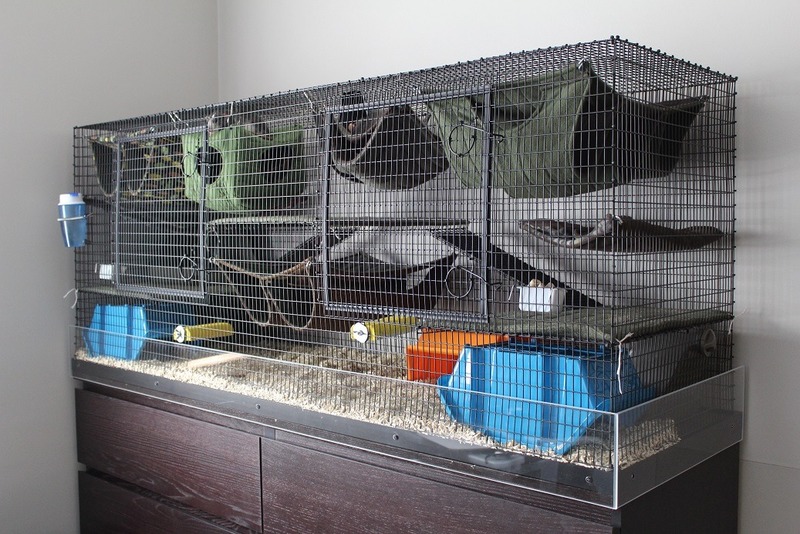 Overall, my goals were to free up some floor space and make cage cleaning easier. No more kneeling down and bending over to clean the lower unit. 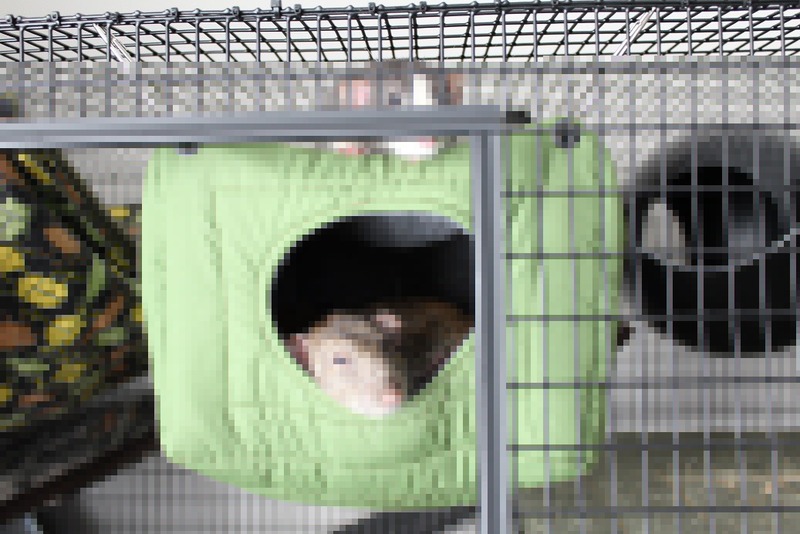 Fewer hammock will hopefully make the full cage cleaning and mid-week cleanings much quicker. The whole cage will be easier to deep clean because it's not as unwieldy as the CN and it can safely be hosed down without as much concern for rust, unlike the CN. I'm still working on figuring out how everything works. I'm going to need to get some new accessories like ceramic food bowls. I'm also thinking I may need some sort of cat tree-ish kind of thing so the boys can climb in and out of the cage on their own. Details, details. I don't plan on getting rid of my CN until I'm confident that this is better for me but so far I'm pretty tickled. Here's Peter Martin and Samuel Hollingsworth enjoying their new cube (made from two 8" x 20" pattern pieces instead of 6 individual squares - 4 fewer seams). Oliver Reynolds is napping on his own on a different hammock. Very nice. I am liking the long long cages more and more. I have two DCNs connected as a quad and right now I have one group on the bottom and one group on the top (rather than separating the two DCNs). It just seems like they have much more freedom of movement with a very large footprint and as long as they have some levels for climbing that they are happy. Plus, my current boys are all old so they don't climb as much anymore. That is a great cage, wow! Martin's ought to hire you as a custom builder. Thanks purple rat and BigBen! My DCN was actually just two SCNs stacked. Because of this, it lacked a mid-level and I think this was one of my biggest issues with the cage. Without that mid-level, I had to get very creative with setting it up and it required hanging a lot more stuff. I used to have the two singles strapped together side-by-side as one long, low cage and I loved it. They really did use the long space to sprint back and forth while playing. Unfortunately, I no longer have the floor space for that configuration so this was my solution. I love the idea of setting up a split quad that way, especially for older rats! Wow that looks so good. 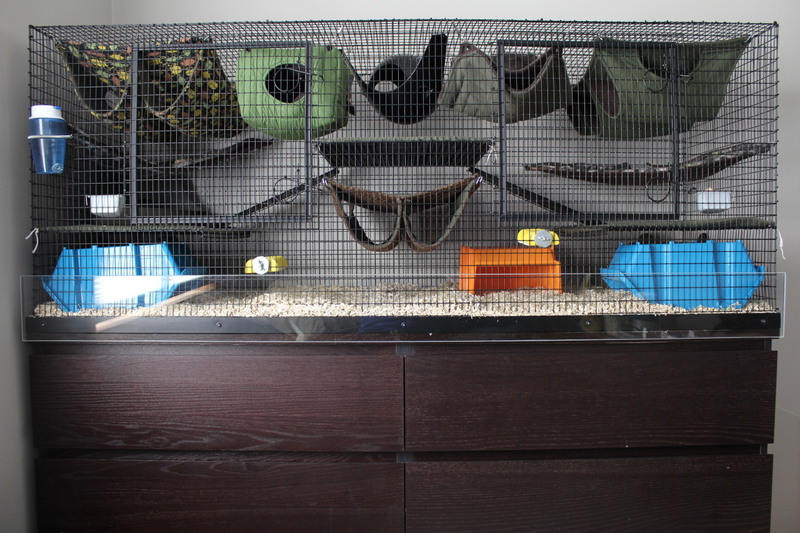 It looks professional and it looks like a great floorplan for the rats. Job well done! I was inspired by the cage build on this thread. I ordered lengths of 16 gauge galvanized-after-weld steel mesh from a company called Klubertanz. After everything was cut and ready to go, I had the pieces powder coated locally and I assembled it with just zip-ties. Major awesomeness! Not to mention cuteness.